Amanda & Jonathan's custom invitation suite, featuring an interlocking monogram, navy letterpress and gold foil - stunning! A quiet moment in the Merrimon-Wynne's beautiful bridal suite. Amanda wore the same Manolo Blahnik heels that Sarah Jessica Parker wore in her SATC wedding. 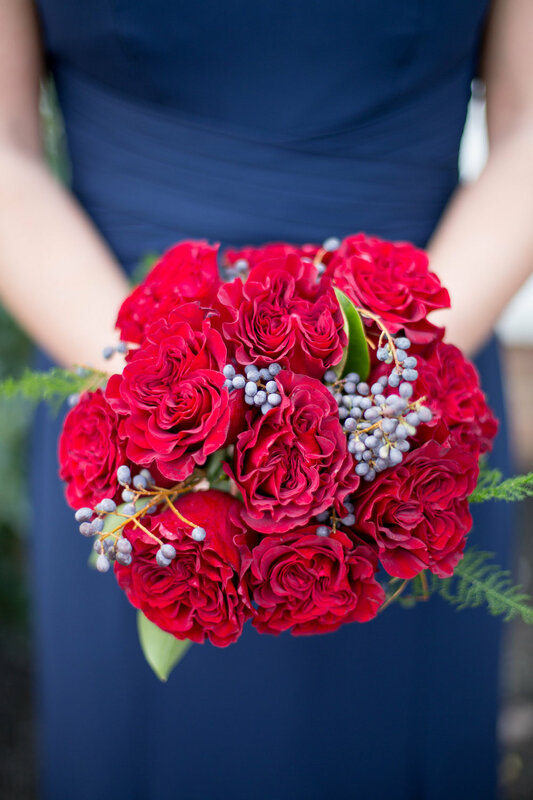 Her bouquet was a replica of Kate Middleton's, with Lily of the Valley and the addition of meaningful North Carolina and English blooms. The evening began with a candle-lit ceremony at All Saints Chapel. 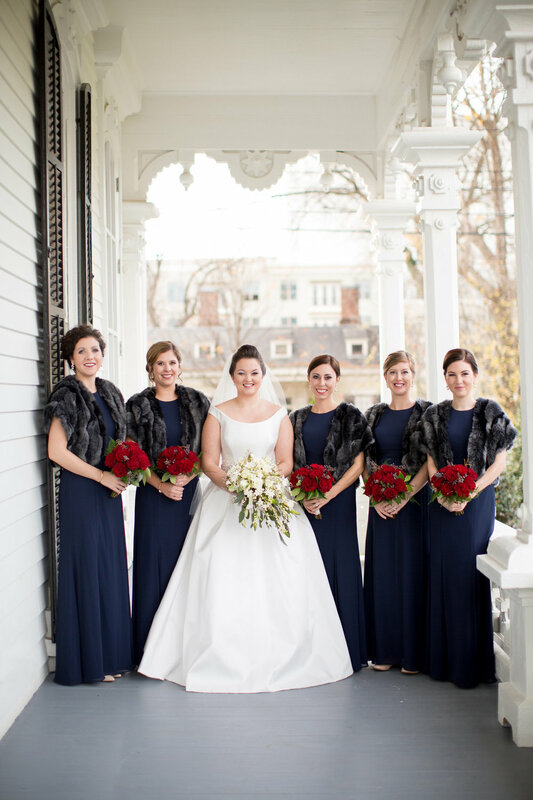 The altar was filled with opulent candelabras, winter white blooms and Christmas greenery. Magnolia wreath wrapped lanterns lined the aisle, creating a warm and romantic setting. 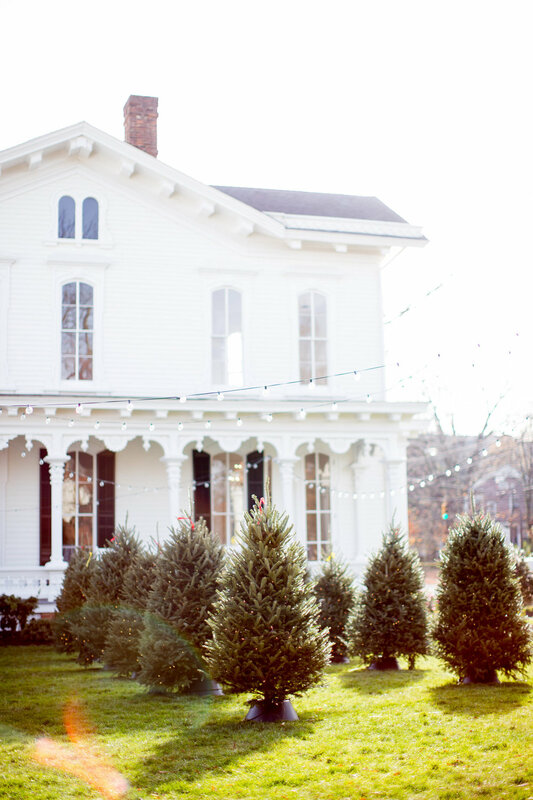 Arriving at the Merrimon-Wynne House for cocktail hour, guests nestled their gifts under a Christmas tree and found their table assignments on hand-painted ornaments, right off the tree! Garlands of winter greenery and magnolia cascaded over staircases and mantles. 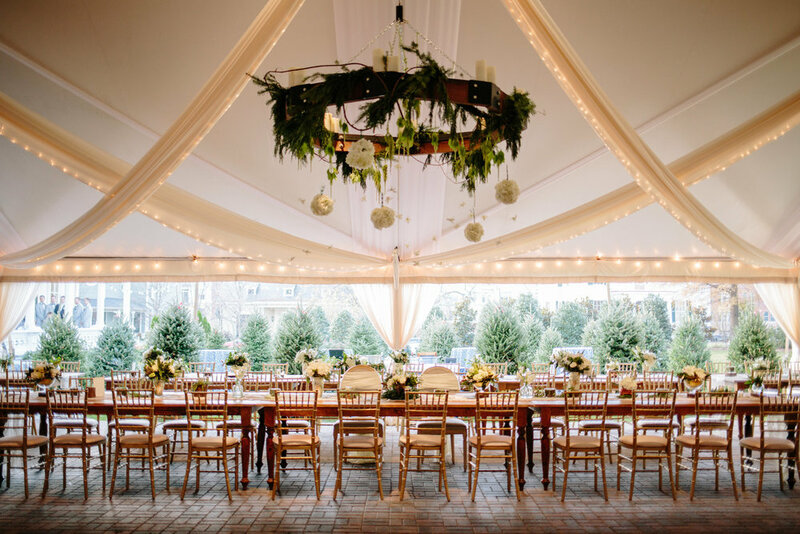 A bar on the lawn, nestled between twenty-six North Carolina Fraser fir trees, gave guests the experience of a lifetime - a cocktail party among Amanda and Jon's own Christmas tree farm! After cocktail hour, guests were invited into a twinkle light- and fabric-draped tent for dinner. 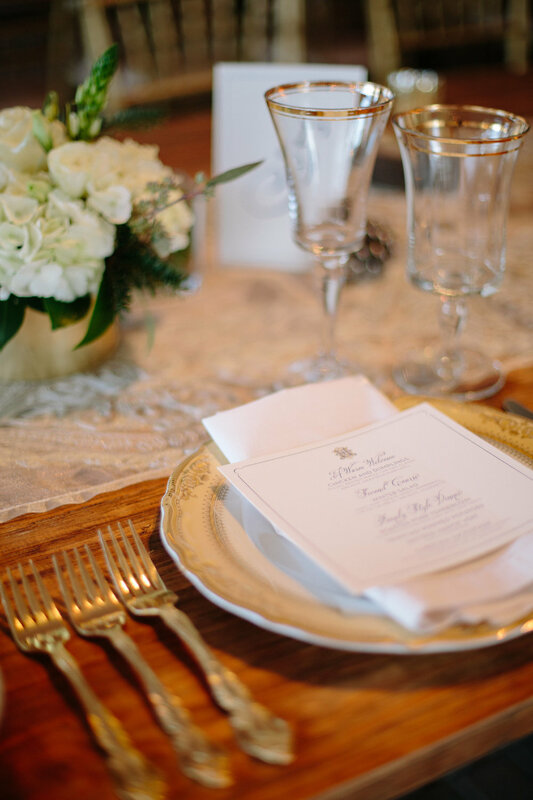 Farm tables were lined in gold embroidered runners and topped with wooden slabs, white flowers, and greenery. Gold-trimmed glassware and flatware added a luxurious touch. A wood and wrought-iron chandelier overflowing with fir and falling flower buds was the perfect centerpiece over the family table. The cake was decked with sugar "snow"
After guests danced away the night, they sent off the couple as “snow” fell from the sky and guests rang jingle bells. What a magical night!